While we are waiting for Neil Young's LincVolt powered historic trek on I-70 to Washington DC, some folks have asked if Thrasher's Wheat can help create an awareness about something very important to many personally and their children's future. Neil Young's send a message to Washington to take leadership in encouraging development, research, and distribution of energy efficient vehicles. By creating awareness, we mean for Neil Young fans to contact their local college & university radio stations to dedicate "cruising" music for LincVolt while it makes it's historic trek across the US on I-70. Please ask stations to dedicate a few songs throughout the day during the time frame when LincVolt might be driving through their area. Ask stations to play music that will inspire, encourage, and transform it's listeners to be better stewards of our beautiful planet. Ask them to dedicate a few songs to LincVolt to keep it's battery charged. Also, internet radio where you can. Besides Rust Radio, we particularly enjoy Radio Paradise who play a fair amount of Neil Young, Wilco, Lucinda Williams, among other faves. Often times, environmental safeguarding like what Neil has been doing has gone ignored when it hits the newswire, but if we call or write, maybe LincVolt will get the truly deserved publicity it needs to make an even greater impact creating an awareness about choosing lifestyles without further harming the air, water, and soil. Where else but to start at the colleges and university radio stations that are not locked into pre-programming and commercials? To begin, find a mapmaking search engine that will locate "colleges & universities" along I-70. Next, locate the radio station address and call letters. Begin there. Write a letter stating why this is an important historic event in our nation's history, a first step in attaining the kind leadership through setting a good example of environmental stewardship, and why the message needs to get out using their radio station. I am not affiliated with Neil, but I wanted to give you a friendly heads up that the Lincvolt team is just about ready to make their historic trek from Wichita to Washington DC which I hope will which I hope will send a message to Washington to take leadership in encouraging development, research, and distribution of energy efficient vehicles. 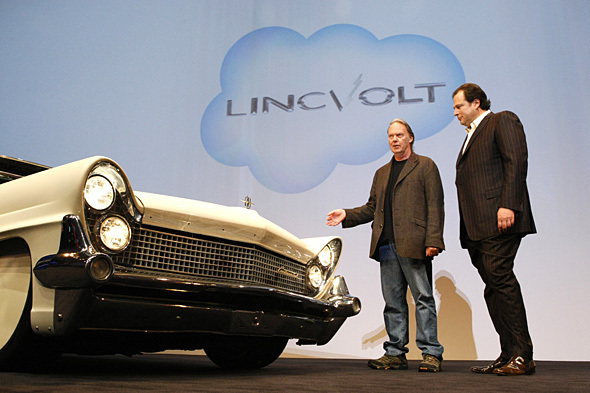 Neil Young's Lincvolt is a 1959 Lincoln Continental convertible that actually creates it's own energy as it drives. By visiting Neil's webpage neilyoung.com or checking out the live streaming from Lincvolt USTREAM, you can learn more about Lincvolt and watch Neil and team prepare the car the for this historic trek. The live chats are fun, too, and I hope you join in. The reason why I'm sending you this letter is because radio has always been the most efficient way to get the word out and what better place to begin than where are future lies? The colleges. Since I'm guessing that Neil & Lincvolt will be passing through your area within the next 2 weeks or so because it is the most direct route, I thought I'd give you the heads up to dedicate a few songs to Lincvolt and Neil to help them along the way. The point is to fill the airwaves with the soundwaves creating an awareness about choosing lifestyles without further harming the air, water, and soil. Are you interested in Lincvolt but sometimes miss the webcasts? Would a digital smoke signal via email or notification to your phone via twitter be helpful? - Or signup for email alerts by sending an email to lincvolt at mileagequest.com (add the @) Please use the subject line "Subscribe Lincvolt". No other communication is available at that email address. Visit www.lincvolt.com for that. We'll send a short alert when made aware of an important event or live broadcast, and as time and circumstances allow. We can't guarantee 100% availability or accuracy so please don't expect that. The Lincvolt team is aware of these accounts and MileageQuest.com reserves the right to grant control, and your email address, to the Lincvolt Team at any time. Thanks Mother Nature on the Run, Karen and MileageQuest.com! 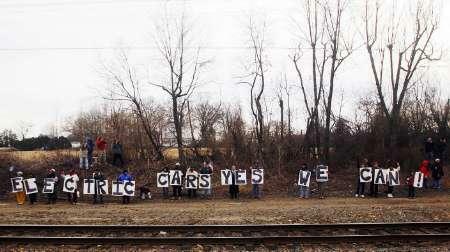 "Electric Cars Yes We Can"
Follow LincVolt webcam and chat. Also, see upper right bar for videostream. If there is a play icon, then stream is live. You can also embed stream in your blog, FB, MS, etc. More on LincVolt Adventures with Neil Young. Neil Young's Lincvolt is a 1959 Cadillac Convertible that actually creates it's own energy as it drives. Oh my, Thrasher. I hope you didn't write that the LINCvolt is a Cadillac. Neil just returned to the garage and Johnathan heard the song that was written for him for the first time while watching to the stream like a lot of us! So much fun! Thanks punkdavid ! Corrected. Yes, i was c&p'g from another source. Anybody have road/car songs to suggest? Didn't it sound like they were changing course and heading in a southernly route to DC? Sorry I messed you up on the Caddy again. For some strange reason, my mind knows Lincoln Continental but my heart is saying "Cadillac." It's that song I've got locked up there *points to head* that I can't seem to shake. MNOT.. I can feel an Archives album comin' on! Hey Dip, I forgot "Car Wheels on a Gravel Road." And did anyone catch Lucinda in the New York Times Magazine yesterday? Maybe if we have time today, we can write her and ask?????? Mother, I'm not always familiar with some of the names you mention in your blogs. Sometimes the 'americanisms' do go over my head for this little Aussie bleeder. Nonetheless, I always read with interest and always know when you've hit someone's raw nerve. BTW, great photos on your blog profile. Sorry for the typo, I wanted to write "missed"